Let’s start from the beginning. IT IS NEVER A GOOD IDEA TO BRING UP COMPENSATION DURING YOUR FIRST INTERVIEW WITH A COMPANY. Of course compensation for the position is an essential question that needs to be answered, but a great way to make a potential employer go from “I am going to hire this person” to “This person is only concerned about how much they will be paid” is to ask about money at the interview. Dr. Sean Grady once mentioned in an interview about this topic, “I have passed on several excellent Doctors, Hygienists and Dental Assistants with great potential because one of the first questions they asked was “How much does the position pay”. Go through the motions, talk to the staff, etc. and make sure you are the right fit for the office and they are the right fit for you. It is typical to have a “Working Interview” or two so the office can see how you work and whether you are a good fit. Once the office has established an interest in hiring you and you are convinced you would like to work there as well, it is appropriate to bring up the topic of salary. Once you have answers to these or related questions, plus the career-related statistics that you should know about as mentioned above, you should have some sort of starting place for negotiating your compensation package. A simple Google search for “-job title- salary” can return you with fairly accurate statistics, as well as a visit to the Bureau of Labor Statistics website. Just search your sought-after position and you will get some meaningful information about pay, bonuses and more data for your area of expertise. 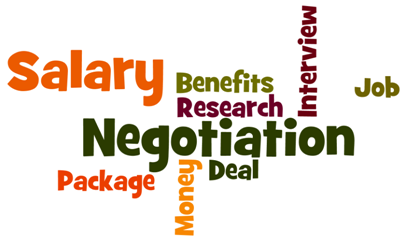 It is also important NOT to start negotiating as soon as the job is offered to you. It is completely reasonable and expected that you may ask for a few days to review the entire compensation package before accepting or trying to work out numbers to your benefit. It is especially important that if you have dependents or others who you may be “working for” that not only the pay but the medical, savings and other plans offered are in line with what you have had before or will require going forward. Make sure to also take into consideration the person you are meeting with for compensation discussions. Many times you will meet with an office manager or another administrative member of the practice to discuss pay and benefits, where you may have interviewed with the owner, general manager or person of another essential position before. The person you are meeting with now may not have been involved in your original talks about the job at all, and it could be the first time you are discussing such things with them. With that said, make sure you deliver your counteroffer or acceptance or denial in a professional, polite and confident manner. Of course, while your paycheck may be the primary factor you try to reach an agreement on, it is not the only one you can negotiate. Benefits such as signing bonuses, insurance, vacation or other time off, parking, various memberships, commissions, professional association or course fees and more should and can be brought to the table. It is important not to nit-pick or nickel and dime every single detail of these, for that can leave a negative impression. You should demonstrate which of these aspects are most important to you and are worth “fighting” for. Know definitively what is right and essential for you to live and grow as a member of the team. If you are unable to come to a unanimous agreement about pay and benefits at these early meetings it is not necessarily worth throwing away the opportunity. Ask to meet after 90 days of work to have a re-evaluation of your compensation package, and to ultimately review your performance. If you have delivered all you have promised and more, there should be some interest from your employer in working out the numbers that you requested in order to keep such an amazing addition to their team for the long-term. Make sure to get any promises or changes made to your contact in writing. When negotiating a salary in the dental industry, take into consideration the number on your paycheck is only one piece of the puzzle. The culture or environment you are working in, the people you work with, proximity to the office, the boss you work for or the actual labor you perform can all have different satisfying factors to consider before the bottom line salary. Making sure you are happy and can grow is most important, so always be sure to choose a position that meets those needs before choosing something temporary like money. Find the dental career that pays and meets all of your needs – keep up with DentalGrind.com for your ultimate oral health employment experience.